Victoria Smith is the founder of Earth Changers, a webservice helping to find and book real sustainable tourism experiences where the travel has a positive impact on the people in the chosen destination and do not harm the environment. Earth Changers has been authorised by the UN World Tourism Organisation as a solution to sustainable tourism for development. 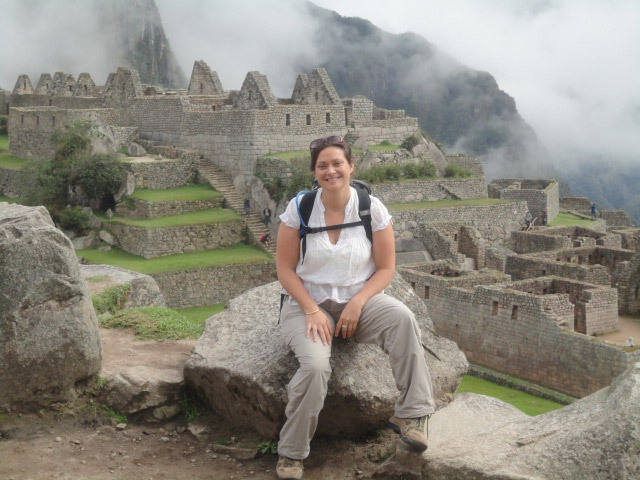 • Why does Victoria Smith focus on sustainable tourism? • Where does she see the benefits of sustainable travel? • How does she involve the local communities? • Which challenges does she meet on her way? • How does she help people and businesses to act sustainable? • What type of tourist book her travels? • Which wishes and hopes she has for the future? I’ve worked in tourism over 20 years. I studied French and International Business at University and didn’t want to go into a blue chip corporate graduate training programme. I wanted adventure. I also loved to ski. So I got a job as a resort manager for a UK ski tour operator in the French Alps for a winter season, followed by 6 month of backpacking the world. I loved it, learned more than friends in those training programmes, more than I expected and more about real life, and so I carried on, managing bigger and bigger resorts, with more and more staff and logistics, and summers too. So began a career in the travel industry. I returned to the UK in the late 90s, became fascinated with a new thing called The Internet which hadn’t yet made it up mountains, and got involved in web development and ecommerce. I learnt a lot but the big digital jobs in travel were in the mass market and my experience of the product, of the negative impact tourism has, versus the positive impacts it can have, turned me to sustainable tourism in the mid-2000s. It’s easy to forget responsible tourism jobs didn’t really exist then, so I juggled other work with developing responsible tourism skills until they could dovetail. I spent years working as a voluntary guide on charity challenges, trained as a ranger in Southern Africa, qualified with a Masters specialised in responsible tourism marketing, published on volunteer tourism as an academic and worked as a consultant in sustainable tourism before setting up Earth Changers. 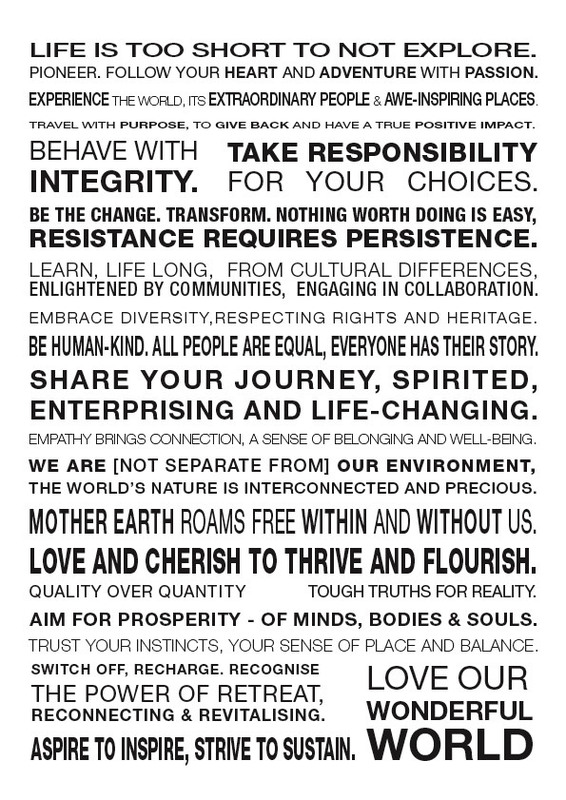 Social – access to food, health, education, culture – language, food, dance, arts, dress, heritage, behaviour, equality, politics and peace. Environment – conservation of the local area, natural resources & capital, ecosystems, landscapes, (de)forestation, biodiversity, wildlife, waste, water, energy, building, pollution and climate change. 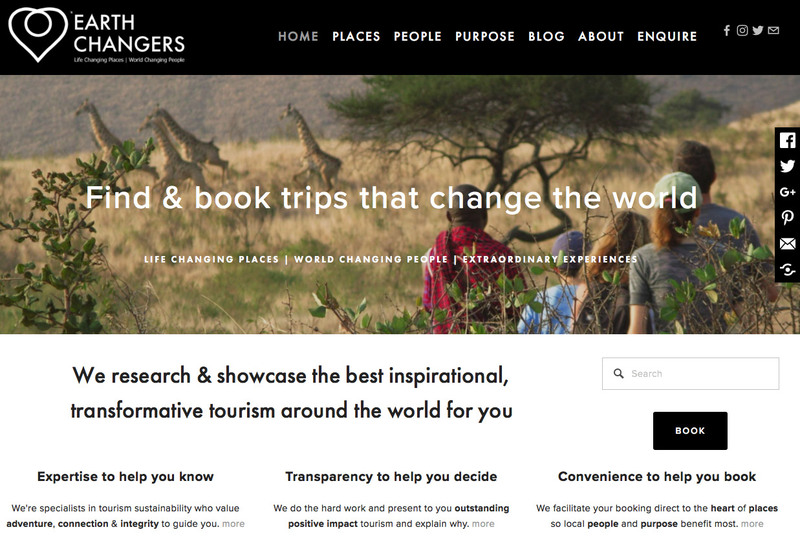 At Earth Changers we research & showcase the best positive impact, transformative tourism for people to find & book trips that truly change the world. We feature life-changing places, with world-changing people, for extraordinary experiences with purpose. All of these involve their local communities. Not only would they not be on our site if they didn’t, they wouldn’t qualify as sustainable tourism. Local community involvement is a vital pre-requisite of sustainable tourism. What are your experiences of starting your business? What was the biggest challenge? The challenges are great, in all senses. My experience means I’ve known the travel industry since the mid-90s, specialised in digital development and marketing since late 90s, and sustainable tourism since mid-2000s. Earth Changers brings all that together. It’s incredibly hard work. But I started alone, and bootstrapped, and there’s a lot to do, to write, to connect, to position, to develop a brand, product, website, channels and audience. Great tenacity is required if you’re truly doing something sustainable, because it’s still more niche consumer interest (not that it should be!) so you’re trying to engage people in the subject as much as educate before you even get to business. To accept finance is often to be asked to deliver ROI impractical on a truly sustainable product basis. And so, if you stick to your principles on true sustainability like we do, realistically it’s a huge amount of work with scant resources and returns. Those who aren’t doing that for the right reasons probably wouldn’t stick it out. – I would advocate everyone gets good experience of their market before trying! In addition for me personally, I started the business when I’d had a ski accident which required knee reconstruction and prevented me from travel and doing previous freelance work. I was relatively immobilised and on crutches for 11 months, with 5 months of pre-hab, followed by surgery, followed by 6 months of rehab. Nothing like 11 months at home in an insular codeine-bubble to create the site you’ve dreamed of for 10 years! It was hard, but it gave me great motivation too – I wasn’t about to sit about and twiddle my thumbs knowing my rehab was going to take a year! We work differently to that, because our product is sustainable – the best positive impact, transformative tourism – at core. We’re interested in hearing from the pioneers of that type of tourism, the top places in different countries around the world, and featuring them on the site where we explain what they do and how to become that innovative and impactful. This helps engage and educate not only the consumer public, but also the other sector businesses who can learn from and emulate the best practice, to improve the industry sustainability level overall. What kind of tourists visit your destinations? Our product is focused on the best positive impacts, so we appeal to different sorts of guests for different types of tourism in different environments of destinations and different styles of holiday. This might be a 5* safari run by the Maasai in Kenya or a conservation camp in rural Madagascar for the benefit of local villages; or a top ecolodge in Costa Rica to preserve primary rainforest; or a luxury laid back holiday on a private island in Indonesia supporting indigenous culture; educational grassroots learning about the Sustainable Development Goals in Malawi; or to see the plastic gyres on epic sailing trips to help marine conservation; or the first community-based tourism in The Galapagos, or for fans of Attenborough’s latest Blue Planet 2, support coral reef conservation in the world’s first private marine protected area. Do get any feedback from the tourists? The real-life experience of these types of trips and destinations far, far outweighs any expectations. They have so much to them, with local community, culture, conservation, as well as holiday, guests will never want a standard trip again. They truly are life-changing places, and not just for the guest, but because the money from the tourism that goes into the local sustainability initiatives truly changes their – and the – world. They are extra-ordinary. What I love is tourism that positively impacts communities and conservation. My hopes are based around my values: travel with adventure and connecting with people and places with integrity. I hope to see a more sustainable travel industry as a vehicle for more money getting into destinations to support global inequality, poverty and climate change, and not into commercial fat cats’ wallets. My personal wishes are to continue to work in what I love, to do that with abundance, and to hopefully leave a useful legacy that impacts the world for the better .